SideNote : This Software is for sell as a product. You can buy this software with source-code from me to resell. Are You Interested ? You can contact me at zrayumtech(at(gmail(com))) or post a comment. 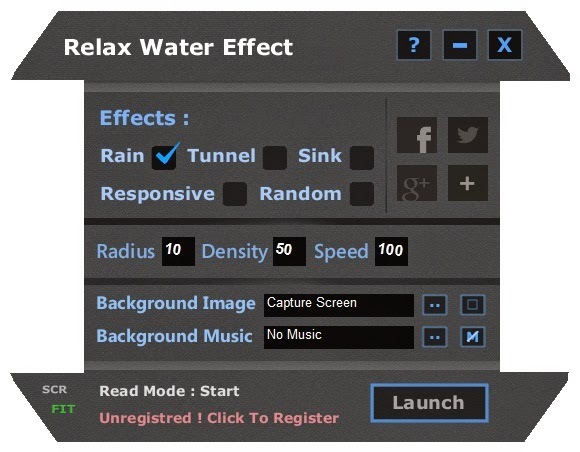 Relax Water Effect is an easy to use application to enjoy great looking water effects on your PC. Here's List of Things You can do with This Software ..
- Add Realistic Rain Effect. - Sink Your Computer Screen In Water. - Make Water Tunnel/Wave Effect. - Enjoy Pouring Water On Your Screen With Responsive Effect. - Customize Background Image and Music To Suite Your Test. - Set This Application As Screensaver. - And Much More Enjoyable Fun Stuff ..
“An easy to use and great looking enhancement you can apply to the desktop of your computer in order to give it a real watery look. Relax Water Effect is a simple yet quite effective means of customizing your screen to give it an original look. The screensaver included in the package can make your desktop look like it is submerged under water.